The Unknown Solider | McGowan Soundworks, Ltd. 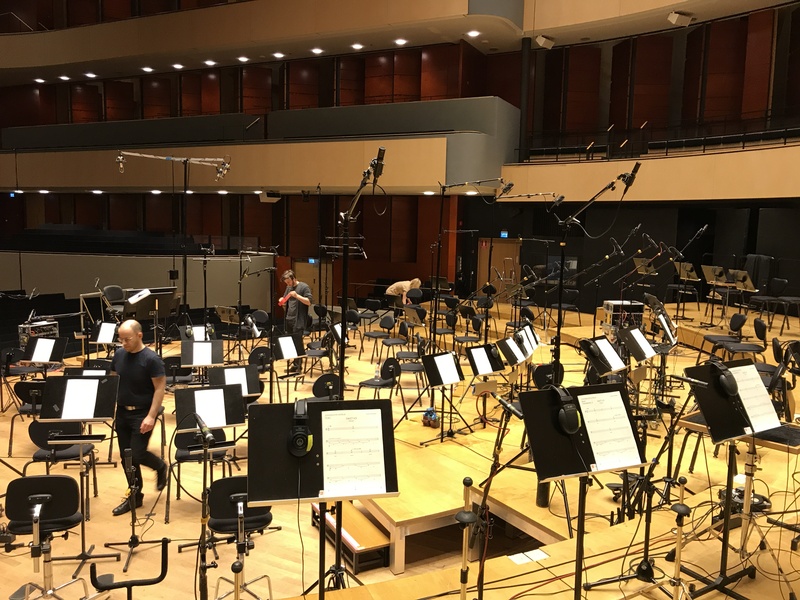 This past April, I had the pleasure of traveling to Lahti, Finland to record the Lahti Symphony Orchestra for Lasse Enersen's score for Tuntematon sotilas (The Unknown Soldier). The film, directed by Aku Louhimies, is based on the well known Finnish novel of the same name by Väinö Linna and tells the story of a group of Finnish soldiers fighting the Soviets during the Continuation War, which occured during World War II from 1941 to 1944. When Lasse first approached me about this film and informed me that we would be recording in Finland, I was honestly rather nervous about organizing a full scale orchestral score recording from scratch. 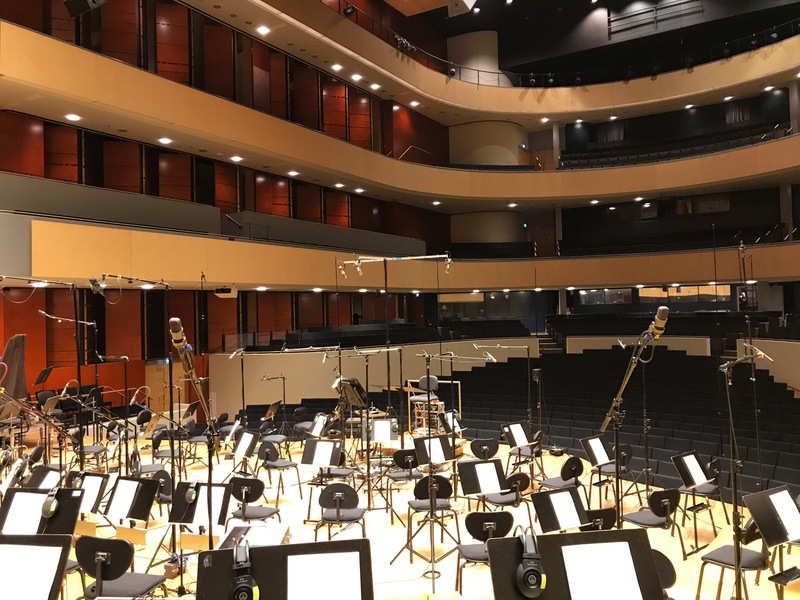 This project involved an orchestra we had never worked with in a hall that we had never worked in and required the acquisition of nearly all the recording equipment necessary for this project. In the end, I'm happy to say that our expectations were not only met but were exceeded in every aspect of this recording experience and both Lasse and I are very pleased with the results. 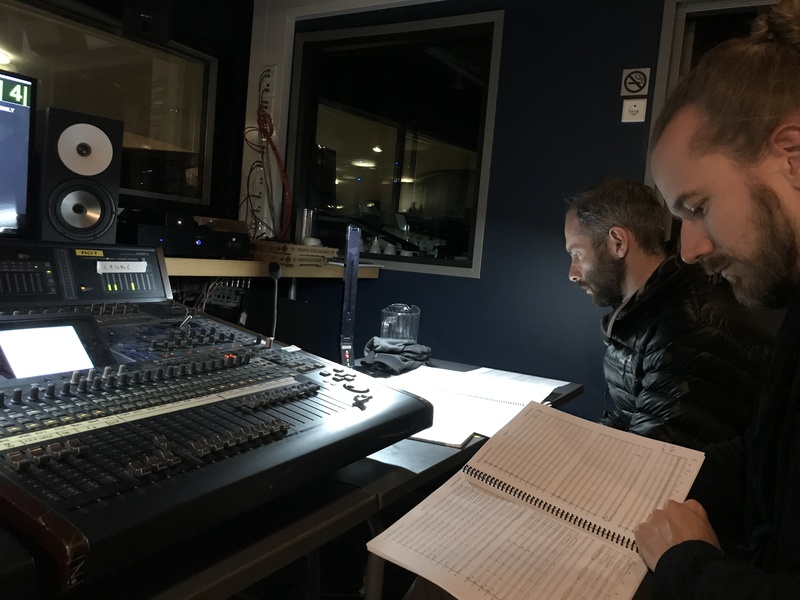 The orchestra performed magnificently under the direction of conductor Dima Slobodeniouk and the setup and provision of recording equipment by Thore Brinkmann of Take5 Music Productions functioned without a hitch. 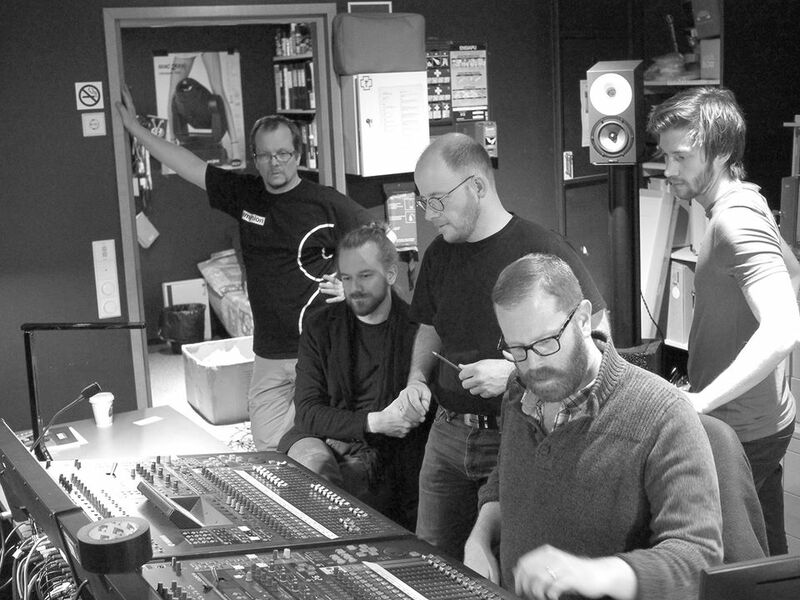 A special thanks is also due to Martin Kantola of Nordic Audio and Anssi Hyvönen of Amphion Loudspeakers for respectively providing a prototype trio of microphones for our decca tree and 5.0 monitoring in the makeshift control room. 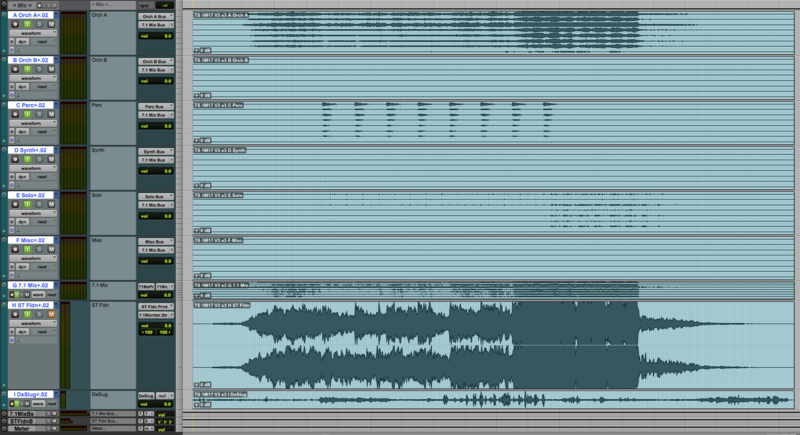 For my fellow music production nerds out there, I've outlined the production process for this project below. For those of you who don't want to get into the technical jargon, I have posted a link to the soundtrack via Spotify at the end of this post as it is now available in the US. 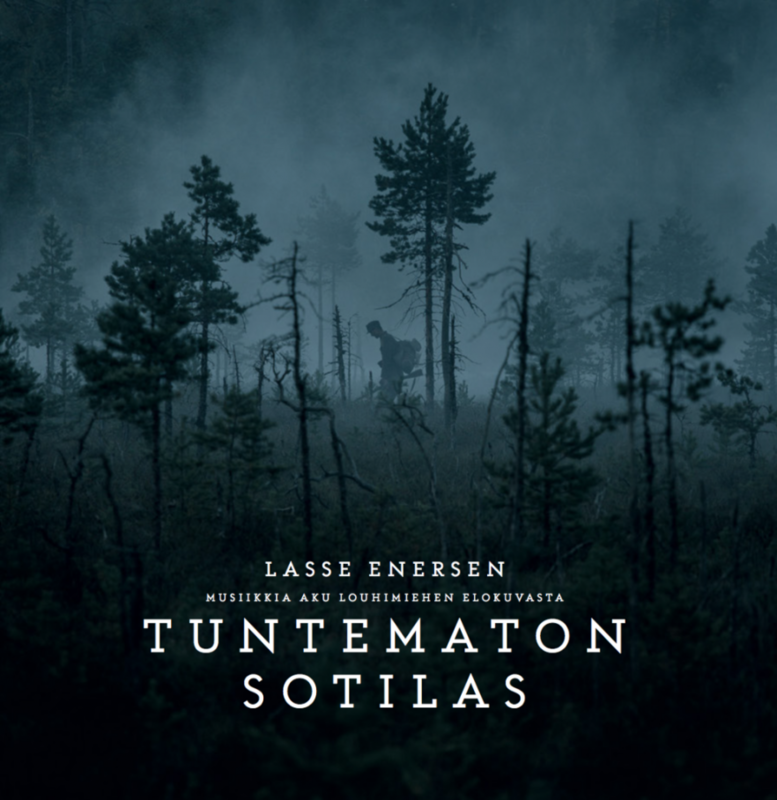 Though the orchestra does have percussionists in their roster, we decided to stick with Lasse's percussion samples as the percussion in the score is very minimal. This also allowed us greater control over those elements in the mix and eliminated a layer of potential complication given that we were working with so many unknowns. 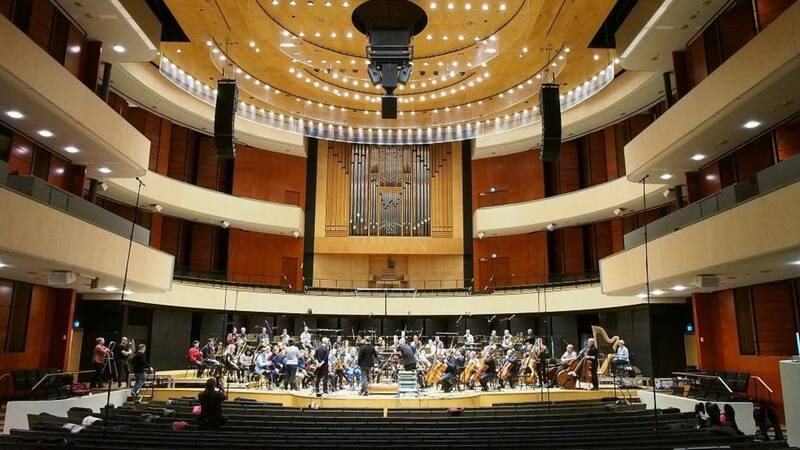 The recording venue was the Lahti Symphony's home base in Lahti, Sibelius Hall. The Hall is relatively large but typical for an orchestral hall with a depth of about 167 feet, a width of 118 feet, and a height of 72 feet. I setup the orchestra in a traditional layout as the musicians were accustomed to playing in this setup though I did reverse the order of the low brass so that the trombones were on the far right with the tuba towards the middle. I find that this results in a slightly wider brass sound with the brighter tone of the trombones on the right balancing against the brightness of the horns on the left. I mic'd the orchestra with a total of 53 microphones, 11 of which were "room" or "ambient" microphones and 42 of which were "spot" or "close" microphones. After learning from supervising sound editor Kirka Sainio that the film would be dubbed in Dolby Atmos, I made sure to record supplemental sets of surround mics to use for the side and rear channels during the 7.1 score mix. 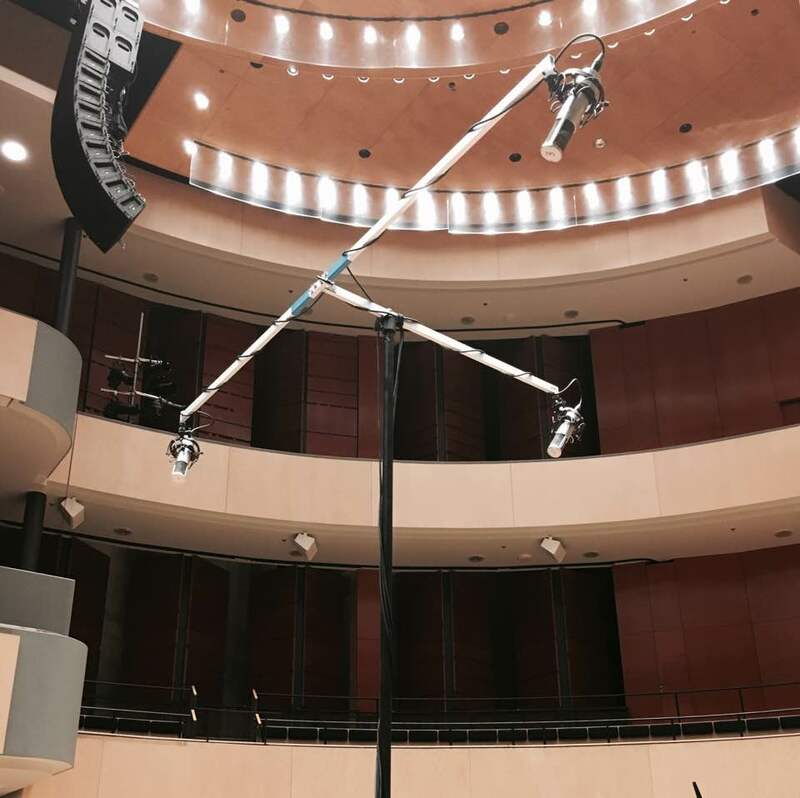 In addition to the typical decca tree, outrigger, and surround microphones, I placed a pair of DPA 4006 microphones halfway into the hall and at the very rear of the hall to capture a few different perspectives of hall ambience. Though I was unable to acquire a trio of Neumann M50s, which are my microphone of choice for a decca tree, Lasse had a prior relationship with Martin Kantola of Nordic Audio who happened to be in the midst of building a set of microphones based on the M50 when we were in the planning phase of this project. Martin was generous enough to travel down from his home in the north of Finland to bring us these prototype microphones to use as our decca tree and even brought along a decca bar mount for us to use. These microphones sounded absolutely gorgeous and were a key element in the sound of this recording. 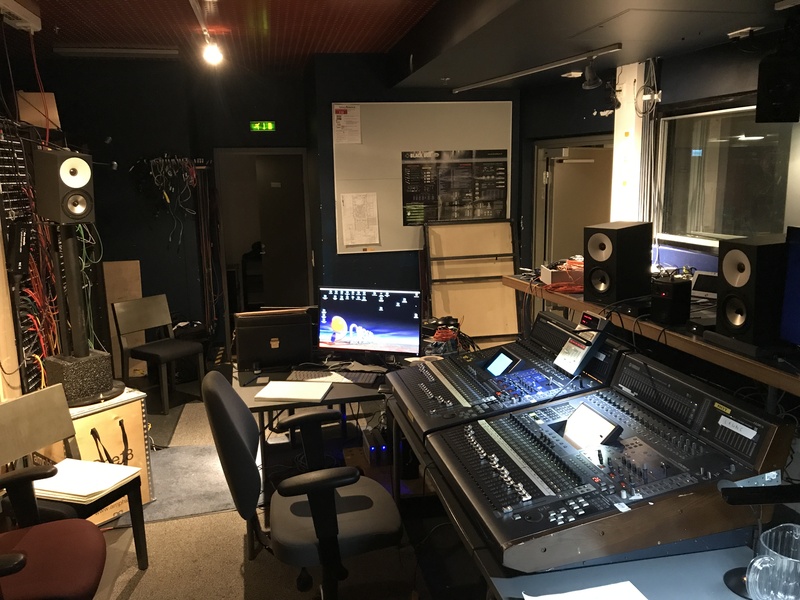 Thore and Take5 also provided all of the preamps, stands, cabling, and headphones in addition to acquiring a Pro Tools HDX|3 system for us to record with. The mics all routed to remote controlled RME preamps located on the stage that were piped via MADI to the tech booth in the back of the hall where we setup our makeshift control room. Take5 also provided a pair of Yamaha 02R mixers so that I could easily control the live balance of the microphones as we monitored the recording. 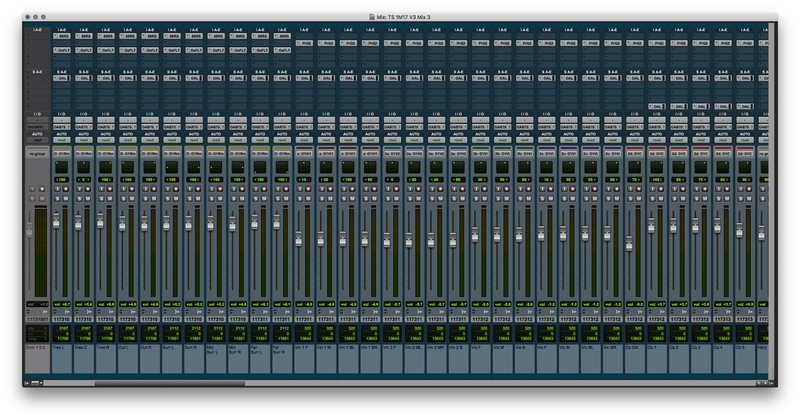 As I was recording at 96k, 2 consoles were required as each console only accepts 32 channels of inputs at 96k. A Lexicon 480L was also utilized in Quad to provide us with some reverb to mimc the likely sound of the final mix. 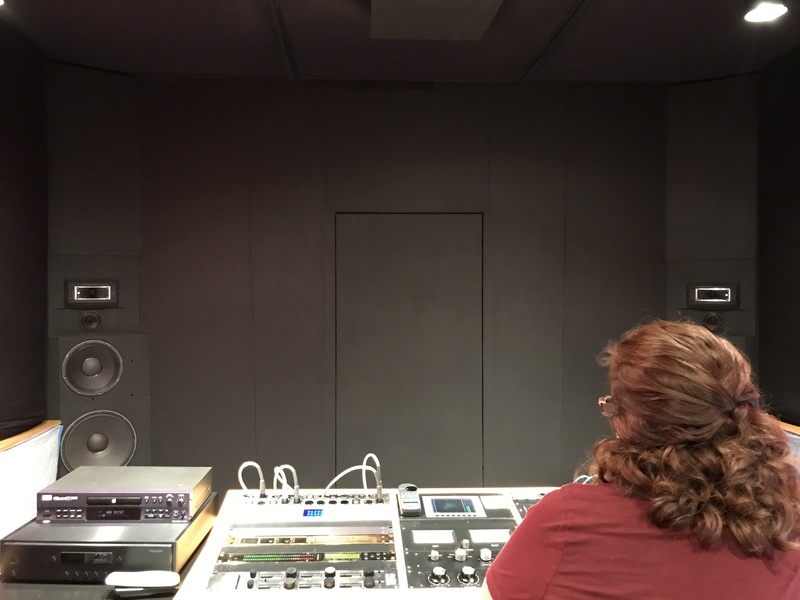 Prior to the recording session, Lasse had also developed a relationship with Amphion Loudspeakers, who had previously provided him with a pair of monitors for his writing studio. Anssi Hyvönen, the owner of the company, personally delivered 3x One18 monitors with bass management for an LCR and 2x One12 monitors for surrounds so that we could monitor the session in surround. The combination of all of this gear and professional effort resulted in a very familiar recording setup that was truly a pleasant working experience. The 2 days leading up to the 1st day of recording were our setup days and it ended up being just the right amount of time to ensure everything was working properly for the sessions. Thore and I were assisted by Samuel Leckborn, who flew over from Sweden with the Pro Tools rig and did an excellent job assisting us with the recording. The evening before the first day of recording, conductor Dima Slobodeniouk reviewed all the scores against my prepared Pro Tools sessions and clicks with Lasse to get a sense of the material we were to record and make any notes ahead of time on tricky passages or places where we were to overdub different sections of the orchestra. Though there were a couple of places in certain cues where we overdubbed or "striped" different sections of the orchestra, the score was predominantly recorded in a single pass with the orchestra all playing together. Dima also requested that since the score was largely legato and the players didn't have a lot of experience recording with click, he wished to be the only person on stage monitoring the click track. For some of the cues, we even opted to shut the click track off entirely and Dima conducted against the bar counter displayed in front of him to keep things roughly in sync whilst allowing the orchestra to perform more naturally. In most score recording situations, this would not have been possible given that the timing and sync of each cue is typically firmly locked to the edit of the film and sections of the orchestra are often overdubbed, requiring the rigidity of the click track to be used for syncing purposes. As the edit of the film was still very much in flux and given that most cues were recorded in a single pass, we were able to either edit the cues against the final picture or in certain places, the edit of the film was adjusted to fit the recorded length of the music. This project had about 65 minutes of orchestral music to record so we scheduled 4x 3 hour sessions over 2 days to record the orchestra. In the end, we only needed 3 of these sessions as the orchestra performed brilliantly and we got through all the material we had to record much faster than anticipated. In addition to the orchestral recording, 4 solo musicians were recorded for this film in multiple locations. 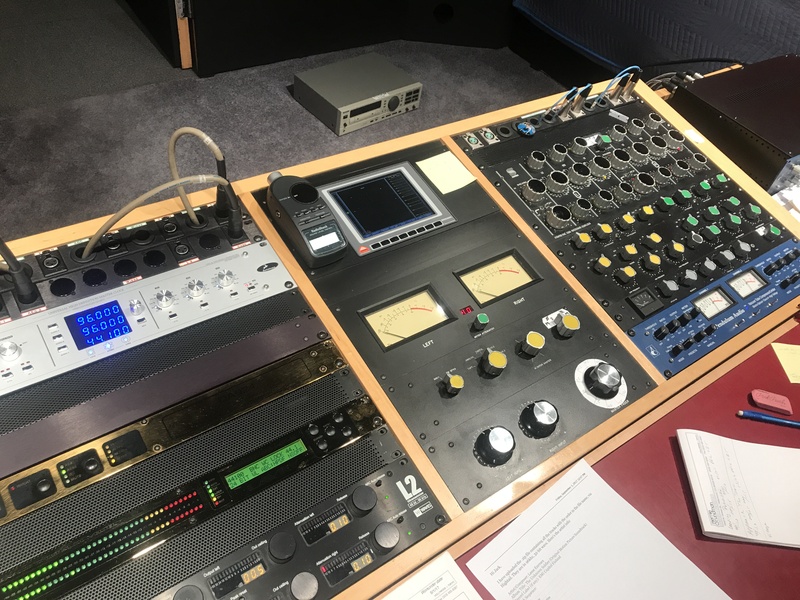 Musical sound designer Steve Tavaglione did a day of synth design and EWI performances at Lasse's studio in Los Angeles and George Doering was also recorded playing Domra on a cue at Lasse's studio while I was mixing at my studio. In addition to Tavaglione's performances, one of the key elements you hear in this score is a rare instrument called the Hardanger D'Amore which was performed by Caoimhín Ó Raghallaigh at a studio in his home country of Ireland. A number of cues in this film were constructed almost entirely from recordings of Tavaglione and Raghallaigh, which provided an intentionally stark contrast in mood to the more traditional orchestral cues. Woodwind player Chris Bleth also recorded solo ethnic woodwinds and effects at his personal studio for a few cues. Lasse required some time after the recording sessions to adjust a few cues so the mix of this score didn't take place until early May, a few weeks after the recording sessions. The main portion of the mix lasted 6 days with a few additional days of mixing occurring sporadically over the next couple of months as the dub required a few adjustments to certain cues and new cues needed to be mixed to serve the updated edit of picture. 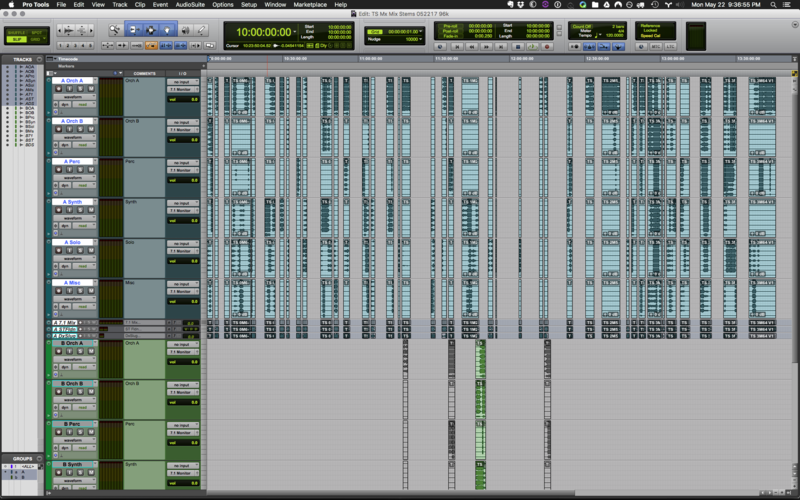 At the time of this mix, my studio only had one Pro Tools HDX|2 rig so each cue was mixed entirely in a single session, including the 7.1 stem print tracks. The majority of the cues consisted of a single pass of orchestra and a varying amount of pre-recorded elements, which overall were pretty thin. 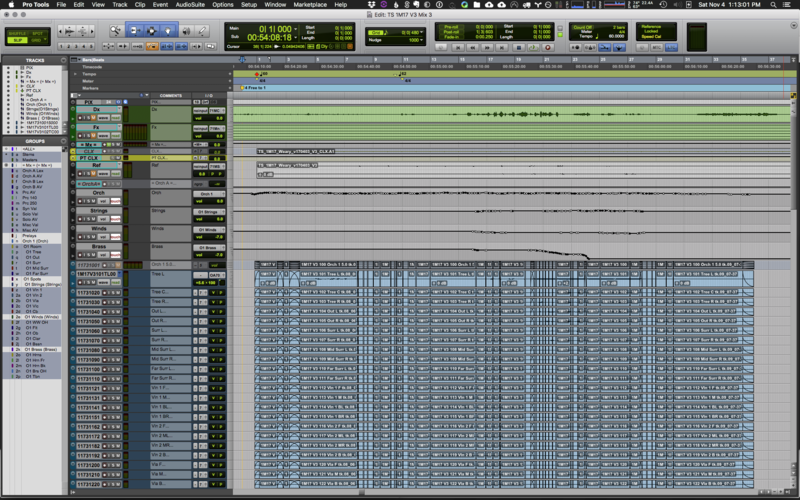 Given that I was working at 96k/32bit, having a light amount of pre-records allowed me to mix this score in a single rig despite only having 256 voices to work with. 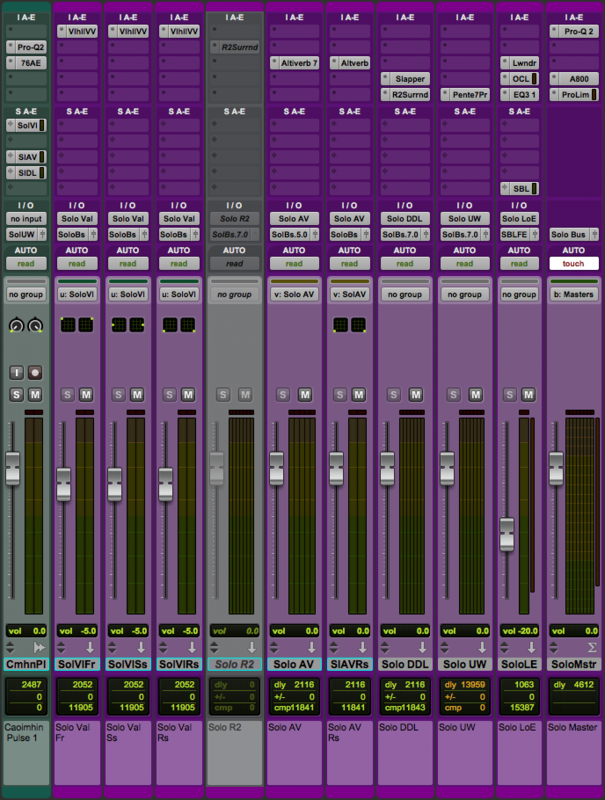 The "ST Fldn" is a fold down (or mixdown) of the 7.1 mix that is normally used just for reference as I usually do a separate mixdown of all the stems for the stereos that go on the soundtrack. In the case of this project, Lasse liked the sound of my rough mixdowns and ended up delivering those to mastering for the final soundtrack release. The "DxSlug" is simply a print of the rough dialogue track that I work against to aid the music editor in re-syncing cues against updated picture cuts. 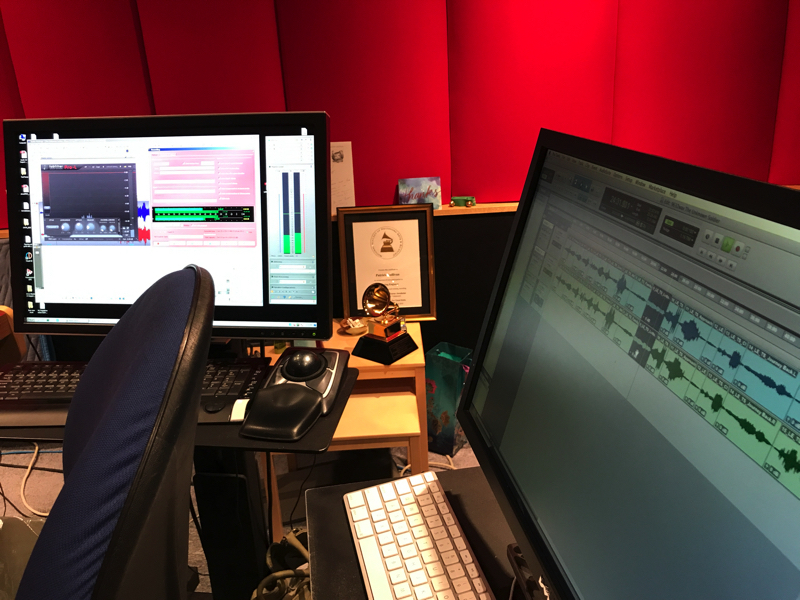 The mix of the orchestra involved some minimal EQ on the individual microphones with most of the tonal shaping occurring on the master fader for the orch stem using a FabFilter Pro-Q2 and a Neve 31102 EQ. As you can see in the screenshot of my orch effects below, I had prepared in my template both a trio of Lexicon reverbs and an Altiverb convolution of the Todd-AO scoring stage but ended up not needing the convolution reverb. Typically I like to add a bit of this "space" to orchestral recordings recorded in smaller spaces to give a bit more depth and size to the orchestra in addition to the Lexicon hall, which is a much more overt reverb sound. For this project, Sibelius Hall offered me plenty of space already so the only reverb that was added was a touch of the Lexicon Medium Random Hall, which is my go to orchestral reverb. 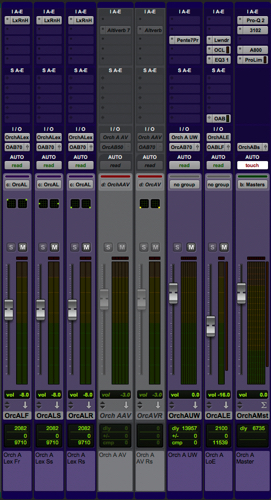 Penteo was used to upmix any stereo orchestral pre-records to 7.0 that we decided to blend with the live orchestra. The Lowender track you see is what generates the sub octave effect on the contrabasses and tuba that feeds the LFE channel. The pre-records were upmixed from Lasse's stereo sequencer outputs using Penteo and also involved some 7.0 reverbs and delays that were added where needed. The cue shown in the screenshot below featured a single channel of Hardanger from Caoimhin that had a touch of Valhalla Vintage Verb, Altiverb, and a wonderful 7.0 delay called Slapper added. The effects setup in my template for the other stems were very similar to the stem pictured below except the Perc stem, which has a few different reverbs that I like to use for percussion. You might notice that the Valhalla reverb used here and the Lexicon reverb used on the orchestra are 3 sets of the same stereo plug-in. 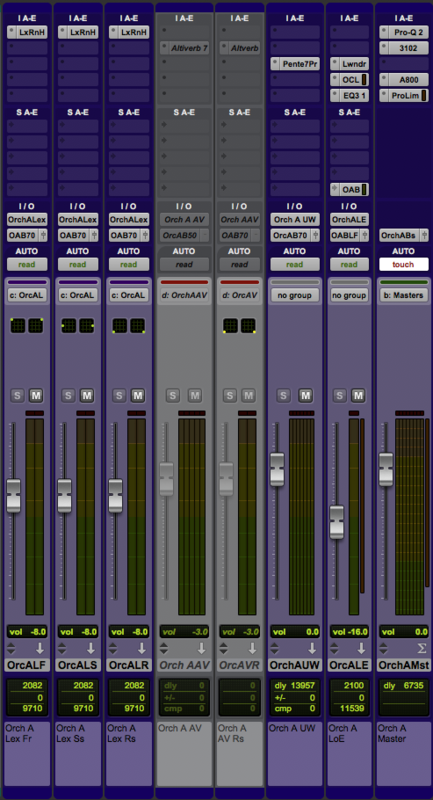 These plug-ins do not have a surround version so when mixing in 5.1 or 7.1, I use 2 or 3 instances of the same plug-in fed from the same bus. 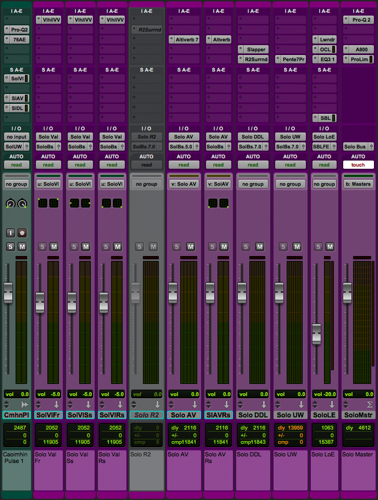 The plug-ins feeding the side and rear channels are the same exact settings except the decay and predelay is adjusted to be slightly longer as the channels move back. This results in the reverb decaying slightly longer as it moves behind you and also helps these multiple instances of reverb to not phase together when folded down into stereo. 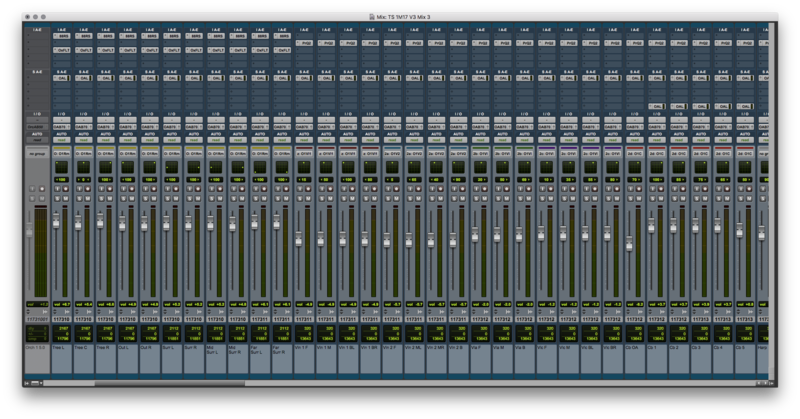 As you may have noticed in the screenshots, each stem master has a Studer A800 plug-in inserted before my stem limiter. I find that the Studer adds a bit of depth and character to my mix stems that sounds very musical and pleasing to the ear in addition to adding a very slight amount of high and low end. I usually set the plug-in to model Quantegy GP9 master tape running at 30ips, which was a typical tape stock and speed used back when orchestral scores were recorded to tape. After the mix of each cue was approved by Lasse, I would export the final stems at 48k/24bit and put them into a super session with an A/B roll of stems that was sent to the music editor for integration into the film. From that point on, I honestly have no idea what additional processing or editing was done to the score as that is all handled by the music editor and re-recording mixer. I did hear some feedback on this film that not a whole lot of processing was done to the score so that was definitely nice to hear! While Lasse was back in Finland for the final dub of the film, he took my 96k/32bit stereo fold downs that were generated during the mix and put together the final soundtrack. Most of the tracks on the soundtrack are individual cues as I mixed them but a few tracks are suites of cues that Lasse edited together. Once the soundtrack was assembled, it was sent over to Patricia Sullivan at Bernie Grundman Mastering in Hollywood, CA to be mastered. Several soundtracks of scores that I've mixed in the past have been mastered by Pat but this is the first time I had a chance to attend the session and it was great to hang with Pat as she did her thing. I won't go into a lot of technical details of the mastering as that was all Pat but she explained to me that she was mostly adding a bit of EQ with her custom built outboard EQ in addition to adjusting the overall level of each track so that it would flow nicely from track to track. As mentioned above, Pat was working from my 96k/32bit stereo fold downs, which were being converted to analog via a Lavry D to A converter that fed her mastering chain. The end of her analog chain then went into a Lavry A to D converter running at 44.1k/16bit that fed a Wavelab rig where the final masters were being printed. In addition to Lasse's incredible writing on this project, many other people executed exceptional work that was essential to seeing this score across the finish line. Music editor Allegra de Souza did an incredible job getting all this music organized and conformed to the final picture and all of the people mentioned earlier in this post played an integral part in this whole process. Last but not least, a huge thanks is owed to Lasse for having me along for the ride. I'm very proud to have been a part of this project. The soundtrack was made available in the US just yesterday so check it out via Spotify below!